Congregation Ahavas Sholom was founded at the turn of the 20th Century, first as a minyan (quorum) which met at the North Ward home of Eastern European immigrants Ada and Leopold Jacobson and then, by 1905, as an organized congregation in a white frame house adjacent to the current building. This congregation was a bit of a frontier outpost: the bulk of the Jewish community–first the German immigrants in the mid-nineteenth century and later the eastern Europeans in the early years of the twentieth-lived in the central ward and later the Clinton Hill and Weequahic sections of Newark. That community would grow to forty synagogues and produce several generations of educated professionals and businessmen. Ahavas Sholom found its worshippers primarily in the grocers and merchants who served the Italian immigrants of the north ward. Mortgage Burning Ceremony on July 15, 1956. From left Ada Jacobson (Leopold Jacobson’s wife) and Mrs. Wymizner. The congregation constructed its current building at 145 Broadway in [1922-23] [?]. The synagogue’s magnificent ark, however, dates from the 1870’s and is a transplant. The ark first graced the majestic nineteenth century synagogue of Congregation Beth-El, later Rodeph Sholom, at Lexington Avenue and 63rd Street in New York City. That building was razed in 1926, the ark stored, and then given to Ahavas Sholom. In 1927, one of Ahavas Sholom’s founders, Leopold Jacobson, an antique dealer and furniture maker, trimmed and installed it in the [four]-year-old building. 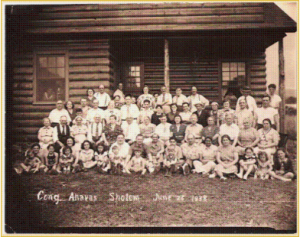 Ahavas Sholoms’s ark is the oldest ark in the state of New Jersey and among the oldest in the United States. In recent years, with the support of Newark Preservation and Landmarks Commission, Ahavas Sholom was named to the New Jersey Register of Historic places and then to the National Register of Historic Places. 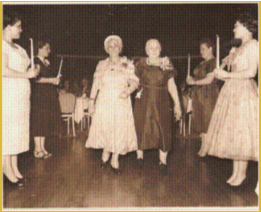 The photographs on the walls of the social hall document an active congregation through the decades of the thirties, forties and fifties. The social hall saw children’s plays, adult dinner dances and card games. There were rural camping retreats. Zionists Sydney Liss and Sadye Gerson campaigned and collected money for the nascent State of Israel. The balcony probably had been built for a separate women’s gallery befitting an orthodox synagogue, but more recently it was used for religious school and the Rabbi Office. 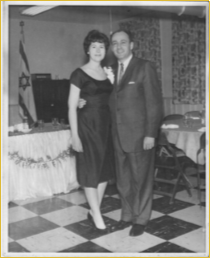 Synagogue members Blanche and Irwin Lerner. He was the treasurer for many years. The synagogue was originally founded as an Orthodox congregation. In the 1990’s it became an egalitarian, Conservative congregation in which both women and men fully participate in and lead services. In 1960 the building was renovated. Rabbi Marton Guttman and his wife, Susan, natives of Hungary and survivors of the Holocaust, came to the Congregation via Israel, and he officiated for the next 25 years. 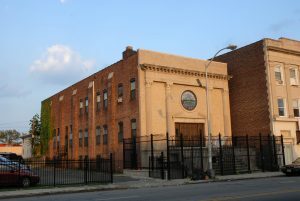 With the exodus of Newark’s Jewish community by the end of the 1960’s, some members of Ahavas Sholom wanted to close the synagogue in the seventies, but the determined effort of attorney Ben Arons, Rabbi Guttman and sisters Bessie Fried and Sadye Gerson saved the congregation and building. Of the forty Newark synagogues, all have either moved to the suburbs or merged with other shuls. One other congregation—Mt. Sinai, primarily composed of Russian emigres in the Ivy Hill apartment complex in Newark’s Vailsburg section—remains and conducts services daily. Daily services are also held in IDT’s downtown headquarters. Rabbi Art Vernon served as spiritual leader from 1996 to 2004. During his tenure, the Congregation affiliated with the Conservative movement, and voted to accord women rights to full participation in the service. Under his leadership a series of special adult education programs have been given monthly, either by Rabbi Vernon or a guest speaker, and periodic Friday night services and dinners were begun. During these years the core of regular shulgoers has made a transition from primarily elderly people, to a wide range of ages and diversity (ethnic and Judaic backgrounds, and geographical origins and locations). New people have found and joined the synagogue, in part because of the roots it represents to Newark’s once larger Jewish community, and in part because of the warm and informal atmosphere at the shul. The Ahavas Sholom Shofar chronicles activities to the more than 350 people who regularly contribute to the Congregation. In December 2001, Mindy Krazmien and Daniel Miller were married in the shul, the first wedding in recent times. Synagogue restoration has commenced. Architect David Abramson (who assisted in the restoration of the Eldridge Street Synagogue in New York), is preparing a master plan. The balcony will house the newly formed Jewish Museum of New Jersey. We have installed an elevator that will take the handicapped from the ground to both the sanctuary and balcony levels. Eric Freedman and Rob Steinbaum started Centennial 2005. The proceeds of this $2.1 million capital fund raising campaign will be used equally for full restoration of the building and for expansion of religious and community programming based in the synagogue. The seed of the endowment has been established, through an endowment fund with the Jewish Community Foundation of MetroWest. The purpose of the endowment fund is to provide a professionally managed repository for major gifts to the Congregation. For more than three decades Ben Aron’s enthusiasm, welcoming attitude, persistent telephone calls, and dogged opposition to the building’s sale kept this congregation alive. 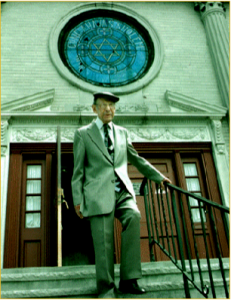 The Ben Arons Endowment Fund for the Perpetuation of Ahavas Sholom, Newark has been named in his memory after he died in November, 2000. Ben was also the founding chair of the Life Line Telethon, the predecessor to Super Sunday, the mainstay of Jewish fundraising in this region. As deeply as the Congregation values the restoration of our synagogue, during the past half decade we have begun to open up to the non-Jewish community in which we live. Elected leaders including Mayor Cory Booker (while a Councilman), former Mayor Sharpe James, Congressman Donald Payne and County Executive Joseph DiVincenzo, Jr. have all visited and spoken at the Synagogue. 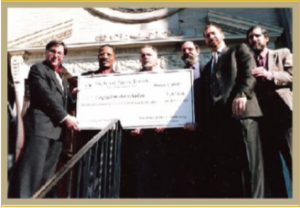 On March 1, 2002 the New Jersey Historic Trust presented of a grant to the synagogue. From left to right, Jerome Raymond, New Jersey Historic Trust, Newark Mayor Sharpe James, Len Sanders, Vice President, Rabbi Arthur Vernon, Eric Freedman, President, Jeff Haveson, Secretary.